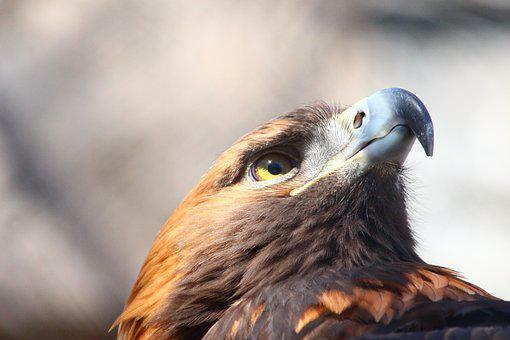 Golden eagles are part of the Aquila genus, there are some sixteen species of aquila including Bonelli’s Eagle Verreaux’s Eagle Booted Eagle and the Tawny Eagle. You maybe able to tell if the Golden eagle is juvenile or not, being the juvenile has white patches at the bottom of the secondaries and inner primaries and also two thirds of the tail will also be white viewable when the bird is in flight. There are six recognised sub species within its global range which are Aquila chrysaetos chrysaetos, A. c. homeyeri, A. c.daphanea ( the largest of the sub species), A. c. kamtschatica, A. c. canadensis and A. c. japonica (the smallest of the sub species). I’ve spoke to Centurian Services which say there is a further eight subspecies although these maybe of subspecies of subspecies of the Golden eagle. The Golden Eagle occupies nearly all the mountainous areas in the north hemisphere, if forests are near by they will have to be sparse otherwise if to dense it will handicap the eagles hunting ability. They will prey upon animals like rabbit hare partridge pheasant and in the warmer weather reptiles, and will feed on carcasses like deer and sheep. Golden eagles in time will build a selection of nests then carry on using these nests making the nest larger and larger each time it is used, some have been listed at being 5m tall and 1.5 m in diameter. They will build the nest so that at the warmest portion of the day that the nest isn’t in direct sun light as to not over heat the nest and most of the time they will use a cliff to build a nest as opposed to a tree and on occasion a manmade structure.